Home renovations are wonderful – you get to update your home to your tastes, and likely increase the resale value down the road. However, renovations are a large undertaking that require plenty of materials, time, and labour, all of which cost money. For this reason, before you even begin to plan the details of your renovation, the first step should be coming up with a budget. It might not sound like the most enjoyable task, but it will help you avoid taking on unnecessary debts by determining at the outset what you can comfortably afford. And if you love HGTV or thumbing through home renovation magazines, a budget can also help you prioritize what is within your reach. To avoid breaking the bank with your next renovation, here are five tips to help you stay on track with your budget. One of the main keys to successfully renovating your home on a predetermined budget is to know as much as possible before the first nail is hammered. It can be easy to look online and make general assumptions about costs, but don’t forget that there can be huge differences in price for things you’d otherwise think were consistent. For example, floor tiles that may look similar in quality can be radically different in price. Small choices like ceramic versus porcelain, or the size of tile can result in a big change to both material and installation costs. Customizing your selected materials also adds to the bottom line. For example, you may see countertop prices and think you know the price per square foot, but things like non-standard lengths and holes that need to be made for sinks and faucets can add to the cost. Once you do come up with a plan, stick to it as best as possible. 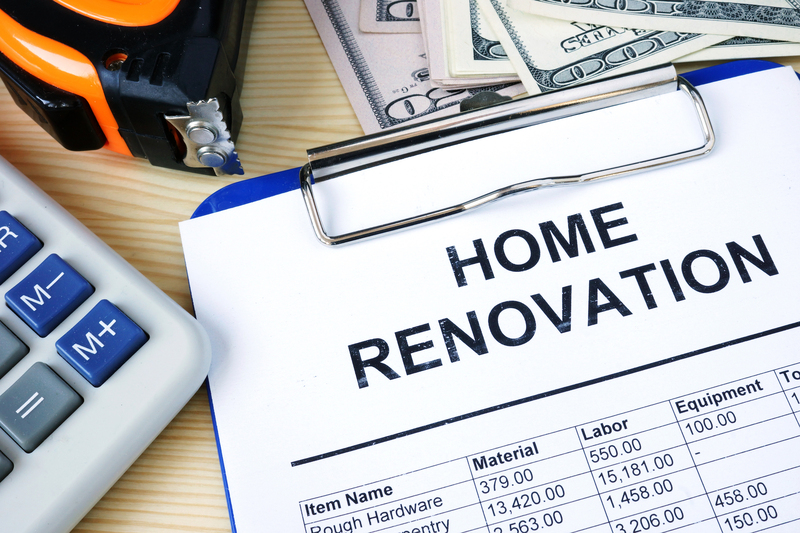 Last minute changes will undoubtedly extend the timeline of your remodel, which means you’ll be paying more in labour costs. You also run the risk of doubling up unnecessarily on materials if you change your mind and are unable to return your original selections. Aside from labour and materials, keep in mind that you’ll likely have to pay for drawings and construction permits. And if your home is older, you may have to update things like electrical work that isn’t up to current code. Also, be sure to check if renovating your home means paying a higher tax rate and insurance premiums. There are also expenses like taxes and shipping on materials, hotel stays and eating out more often which can add a hefty sum to your budget. Overall, it is a good idea to budget 20% of your initial renovation costs for potential changes, material or design upgrades, and unforeseen costs. If you plan ahead, you can see an itemized list of what will be costing you money. And if one line item seems high compared to other higher ticket items, you can likely find comparable items at a lower cost. For example, while fancy lighting fixtures may look beautiful, they can cost a pretty penny. To reduce costs, see if the same style can come in different materials, in a smaller size, or can be created to be a bit less ornate. If you’re having a hard time choosing materials or knowing what a comparable alternative is, an interior designer can guide you. When you’re ordering materials, don’t be scared to ask for discounts. Just because they gave you a quote doesn’t mean it’s not negotiable! Or you can always ask your contractor too if they have a recommended supplier – contractors are often repeat customers who do a large volume of orders, so they can have more leverage for price negotiations. Also, be sure to tell your contractor your budget. Many people assume a contractor asks because they want to upsell you. However, the real reason for this is they need to see how they can best help you. Good contractors will always work with you to hone in on exactly what you want to make your renovation dreams come true within your allotted budget. If you are ready to renovate your home or have questions about the renovation process, schedule a conversation with us today!